A summer evening social in the bar or on the terrace of The National Liberal Club, at 1 Whitehall Place, SW1A 2HE from 8pm. 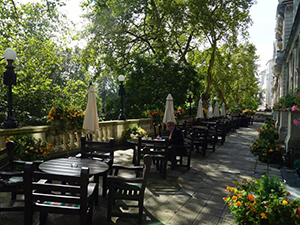 Always a very popular venue with its impressive but relaxed surroundings, where members and guests can chat on the long terrace near the river until late (see picture). Reasonable bar prices are also an attraction. We will have dinner at 6.30pm in the magnificent Club Dining Room, with the cost all inclusive expected to be around £45. If you wish to join us for drinks and/or dinner, pleasecontact us'. Early booking is advised!